Charlton 1976 by Carol Kenna & Steve Lobb. Crown Paint. 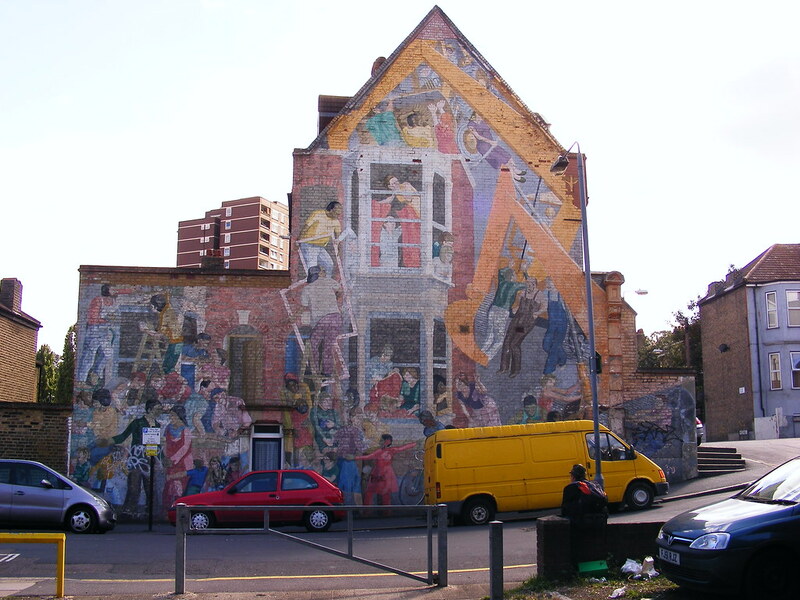 One of London's earliest community murals! The Floyd Road mural is a great contender for being a good example of what was meant by community murals. This painting situated on the gable wall of a Victorian terrace, shows the people working together to stop their housing being destroyed. Many attempt to halt the diggers. Others pull together to paint and repair the building. All ages and ethnic backgrounds are shown talking, smiling, communicating and working together to fight the people who are happy to destroy their community. The mural was created in 1976 by the Greenwich Mural Workshop for the Floyd Road Tenant's Association. Initially, the brickwork was prepared and stabilised. Then the design was painted onto the wall using paint sponsored by Crown. The Arts Council, London Borough of Greenwich and Greater London Arts also help to fund the painting. The main themes were celebrating stopping part of the street being demolished, suggesting that rehabilitation of property has more benefits than redevelopment and to show the locals working together and enjoying each others company. The design successfully achieves this vision. This is evident in the story of the mural as caught on the documentary " Morgan's Wall" made in 1978 by the Arts Council. Now in it's 35th year, the piece still stands to remind the local people what can be achieve when they work together. We're currently researching the history of this mural. If you can help us with any stories about Floyd Road, please get in touch. This mural is in surprisingly good shape for being nearly 35 years old. Some sections are missing. There is a small amount of graffiti and it is quite faded.